I’m a Gator. Err…was one. You know the Gators? The ones who won national championships in both basketball and football in 2006-07 and repeated in football last year? No? I wouldn’t have known or cared myself, except I went to UF for a couple years. After small, private high school and college experiences, going to a big, consistently-voted-one-of-the-best-party-schools-in-the-nation type place was a change. No really, it was. People start tailgating for games at 11am, and there are so many rabid fans that a game experience can be a little frightening (and hazardous to your health…in so many ways!). But it is an enormously good time, as well. On game day is the only day that I can truly say Gainesville is a wonderful place to live. The community of fans and alumni and students are equal parts crazy and fun, and when they converge for a sporting event, it’s out of hand and off the wall. So on the night of the Final Four game, March 2007, I was driving my scooter to campus. Plan: sit in a bar on University Avenue with friends and watch the Gators play victorious basketball. But as I turned the corner into the campus parking lot, my scooter malfunctioned. More specifically, it felt as though the throttle got caught in the “on” or “faster!” position, and I couldn’t brake enough to slow down. I know they always say that in the seconds before an accident (if you’re aware it’s happening), time seems to slow down. You know: everything in slow motion, and the reactions going across your face switching at light speed from blissful ignorance to alarm, to horror, to pain… At least, that’s how they portray it in the movies. For me in those moments it was like everything sped up. I had maybe a quarter of a second to log the fact that the brakes weren’t working, and then a half second after that to make a decision to either steer toward a line of cars or take the curb. I chose curb. I’d do it again if I had to make the decision over. Me + scooter + curb/pavement sounds a lot better than me + scooter + a huge hunk of metal and possible crushed-in-between-ness. The whole street was full of pedestrians, and someone came over as I was dazedly jerking off said helmet. I heard several gasps, “It’s a girl! A GIRL just crashed! Someone call 9-1-1! Oh my God! ‘9-1-1? Hi! I’m on University Avenue, and a girl just crashed her scooter. Yes, she’s moving. Oh my GOD, are you okay?? ?’” And on. And on. Being as they were expecting lots of drunks all over the place, police and firefighters were ready and waiting to respond. I think both were at the scene in less than five minutes. I just struggled to wrap my head around what had happened. A bystander helped get the scooter off me. I scrabbled a bit in my jeans pocket for my phone, and sub-consciously assessed my injuries. Head: alright. Arms, shoulders: check. Legs: left a bit dodgy, right seems okay. Hands and feet: bleeding. When I had my wits a bit more together, and right before Emergency Services arrived, I called my friend R.I. on the phone. She answered, “(bar noise in background) Hey Ceecee, we’re at the bar!” Me: “I got in an accident.” R.I. : “Are you okay? Where are you? How bad was the accident? On your scooter?” I’m told I answered back very calmly and told her exactly where I was, and asked if she could please come get me? Apparently my composure on the phone convinced her that it mustn’t have been a very bad accident, because when she and another friend got to the scene, they were pretty shocked. I mean, who wasn’t shocked? I was DEFINITELY in shock, random pedestrians were shocked, and the responders were maybe not shocked, but not exactly pleased and happy, either. I pretty much knew by this point that there was something seriously wrong with my left leg. I’ve been able to tell since age 12 whenever I had a broken bone. There’s a certain level of pain that only ever comes when you’ve really messed up your body. I was experiencing that hurt. Firefighters? Not convinced. Said that it was probably just a knee sprain, but as I couldn’t walk on it, I’d better go to the hospital. There was a policeman mentioning something about reckless driving...I don’t remember that much after that. I believe I signed some forms, while R.I. rounded up friends to put the scooter in someone’s truck bed, and then I called roommates to come deliver my insurance card at the emergency room. Off we went to the hospital. The hospital where on the night of the Final Four game, EVERYONE was seen before me. People with breathing problems. Crying babies. Old folks having panic attacks. Drunks arrested after bar fights. Everyone. Status: in fairly excruciating pain, hadn’t been seen and had no pain relievers. I got to the ER at 9:30pm, and I was eventually seen at 4:30am. At which hour they took an X-ray, told me it was a sprain, and gave me a prescription for painkillers, crutches, and a knee brace and sent me off into the Florida night. UF won the game. I think that was the only upside to the whole experience. I crutched around campus for a couple of weeks (which was NOT FUN), and eventually was able to walk and resume normal activities. I tried playing water polo a couple of times, but felt that the knee was pretty weak, so I was careful and eventually gave up the idea, at least for the rest of the school year. After the end of classes that May I went to Chile for two months, and when I got back I went home to Seattle before returning to Florida. During the visit I went to the pool with my mother for an afternoon swim, and dove from the pool deck into the deep end. My knee gave way. I had to tread water one-legged and wait for the pain to subside before I could even speak and let my mother know what was wrong. She promptly insisted that I see a doctor for a second opinion. So I went. You do not turn your mom down when she’s worried about your health! Or at least I don’t. Turns out that when the scooter crashed, I tore both the ACL and meniscus in my left knee. SHREDS of the ligament were holding my knee together. 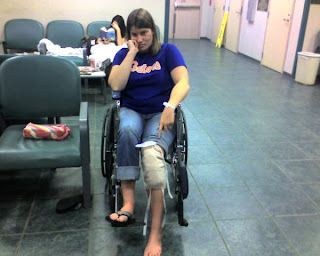 The doctor told me later that had I fallen again, or played water polo a little too aggressively, I would have likely snapped the ACL all together, my leg would have seized, and that would have meant immediate surgery. As it was, the only open slot I had for surgery and recovery was the upcoming Christmas vacation. Later in the year I had the surgery (the doctor said some squeamish things I shall not repeat here about how little of the ligament was left) and an appropriately painful and groggy Christmas recovery at home. I've since been physical therapy’d into almost complete recovery. I think I have about 90% of the function back. I play water polo and can run a bit (like, to catch a late bus. Not anything like REAL running.) at any rate, which is all I need it for. The knee does ache when the weather changes, though, and I’m bound to get early arthritis, so it’s not all roses. Mostly, it's a crazy story and some weird scars. And that’s the tale of my most serious injury, folks! i remember a lot about your Christmas "recovery"... more like slave labor and "cece entertainment"
You have amazing recollection for a person "in shock". Actually, now that I think about my most harrowing experiences, I guess they're permanently embedded in my brain too. How can we forget? Fortunately, I didn't get injured, and never experienced that searing pain. But on several occasions I had automatic rifles pointed my way and heared whizzing projectiles within inches of my head. That's something I won't forget. Nor will I forget those little softball-sized steel-encased explosive-filled items (about the length of a football when you included their metal fins) that shook the earth (and me)as they exploded in my vicinity. Nope. Those were not fun times. Real downers. I can sympathize with you, though I can't feel your pain.